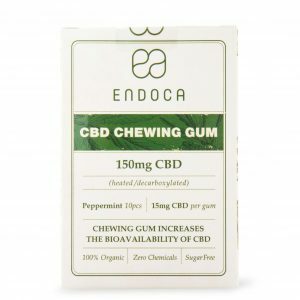 Endoca CBD Chewing Gum. Pure and natural chicle gum sourced from the Mexican Rain Forest. Environmentally friendly and completely biodegradable which means it can be swallowed and disposed of with no harmful effects. Wild peppermint and mint essential oils. Sweetened with Xylitol which is a natural sweetener sourced from birch tress. This gum is discreet, no hemp smell on your breath, no capsules or liquids you might worry about leaking. Simple, fast, tasty and fun. 10 pieces per pack, 15mg CBD per piece.